Kim Kardashian bashed Taylor Swift in her recent interview of “GQ,” and now the two have some bad blood. Kardashian told the magazine Swift knew all along Kanye was including her name in his song, and that Taylor completey played the victim card. Kim later went on to say she has video proof of the phone call that took place, showing Taylor’s consent. We guess that makes sense considering the Kardashian family is constantly taping for their show. However, Taylor Swift wasn’t going to shake off Kim’s comments. Swift’s camp released a statement with some pretty passive aggressive remarks that stated the singer’s side of the story. “Taylor does not hold anything against Kim Kardashian, as she recognizes the pressure Kim must be under and that she is only repeating what she has been told by Kanye West. However, that does not change the fact that much of what Kim is saying is incorrect. Kanye West and Taylor only spoke once on the phone while she was on vacation with her family in January of 2016 and they have never spoken since. Taylor has never denied that conversation took place. Taylor has denied having any knowledge about West’s song. 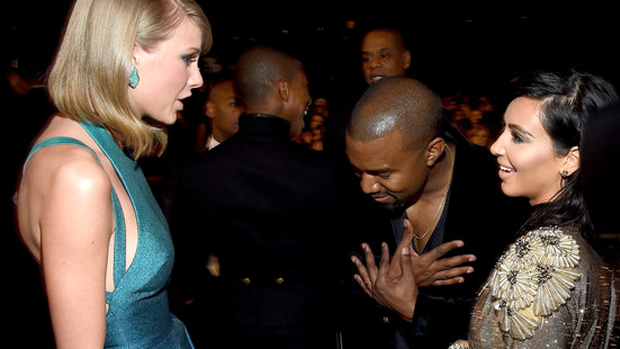 A recording of West also leaked shortly after the release of the tune, where he stated that Taylor was a “fake a**.” In response to his remarks, Swift threw in some shade towards Kanye during her Grammy speech, reminding women to never let someone else ”undercut” their success. Looks like we have two choices here – wait on Taylor to expose the truth in new music, or wait on Kanye’s proof – both equally entertaining.